As the fashion world incorporates environmental and other ethical concerns into brand identity, sustainability is becoming the new normal. In other words, eco-chic is going mainstream. Pantone's color of the year for 2013 may be emerald, but the collections at New York Fashion Week are lush with many shades of green. From linden to deep lichen, designers are using the colors of nature to make fashion come to life. The literal abundance of green on the runways is also a fashion statement that reflects a deeper trend within the industry. As the fashion world incorporates environmental and other ethical concerns into brand identity, sustainability is becoming the new normal. In other words, eco-chic is going mainstream. How did green fashion go from being associated with shapeless, colorless, scratchy garments made for a niche anti-fashion customer to being a paragon of luxurious fabrication, cutting-edge style and steady market growth? Part of the answer lies in changes in regulation, but other factors have been on display at Fashion Week itself. Perhaps the most important reason for green's growth throughout the fashion scene is a deliberate shift toward presenting sustainable fashion as not separate and unique, but simply fashion at its best. The Organic by John Patrick line exemplifies this trend -- other than the reference to organic in the name, the clothes stand on their own as wearable commercial looks apart from any environmental claims. Other eco-friendly lines are also presenting themselves as equals in the Fashion Week milieu; notable examples include the Dolphin Organic skin care line and VOZ, which pursues "change through beauty" by working with skilled artisans to create sustainable style. Branding green fashion as the new normal is likewise becoming a common practice within the broader fashion world. Designer Stella McCartney and prominent influencers such as Livia Firth and Vogue have long promoted the integration of sustainability into luxury style. American Apparel and Footwear Association Maverick Award-winning designer Yeohlee Teng has made local, zero-waste production an invisible but omnipresent part of her signature style, from using manufacturers in New York's Garment District to reusing pins from her studio floor. The same goes for Diane von Furstenburg and the Council of Fashion Designers of America, who have helped mainstream green design through the CFDA/Lexus Eco-Fashion Challenge. One of the designers to win the inaugural award, Maria Cornejo, quietly uses environmentally friendly materials in her signature line, which has been worn by First Lady Michelle Obama -- without a single mention of kale. The styles shown at Fashion Week appear online within seconds of coming down the runway. This same immediacy also applies to information about the supply chain. Production in a foreign country no longer hides environmental harm from view -- carbon dioxide output, photographs of water pollution, waste disposal practices and even micro-analysis of the chemical composition of textile treatments are often just a URL away. The resulting transparency has helped promote environmental consciousness throughout the image-conscious fashion business. Among designers and retailers, integrating stronger standards has become essential if they want to avoid becoming part of a negative news item themselves. Knowing more about the fashion industry has also affected consumers, for whom fashion is an extension of their personal identity. Both government regulators and the industry itself have taken steps to make sure that environmental consciousness is not simply a marketing gimmick. Late last year the Federal Trade Commission issued a revised, more rigorous version of its Green Guides, which provide standards to keep claims about eco-friendliness from being deceptive. Designers, retailers and nonprofits are also working together to develop new environmental impact standards. The most high-profile example of this is the Sustainable Apparel Coalition, an initiative spearheaded by such companies as Levi's, Burberry, Nike and Patagonia. Attendees at Fashion Week are used to reading descriptions of the styles coming down the runway. However, technology chic is becoming an equally important part of the fashion scene, as designers pursuing sustainable fashion describe in detail the how their creations are produced. Techniques for repurposing vintage clothes, new methods for producing carbon-neutral yarn, advanced technology for waterproofing, strategies for zero-waste production -- designers have begun using Fashion Week to explain the science behind the style. For years, sustainable fashion had a reputation for dull colors and drab designs. That is rapidly changing, and not only because of such eco-conscious fashion celebrities as Stella McCartney. For instance, Organic by John Patrick's fall 2013 show generated buzz with eco-friendly looks that included hot pink, cropped sweaters, and on-trend longer hemlines. Similarly, Vaute Couture, the first all-vegan line to show at Fashion Week, won kudos for its "faux meets fabulous" collection inspired by anime heroine Sailor Moon. Beyond online social media such as Twitter and Facebook, creating real-world connections has also proven to be an effective way of making eco-chic more than a niche market. Vaute Couture offers a stellar example of a brand that is a building a community that associates green fashion with celebration rather than sacrifice. 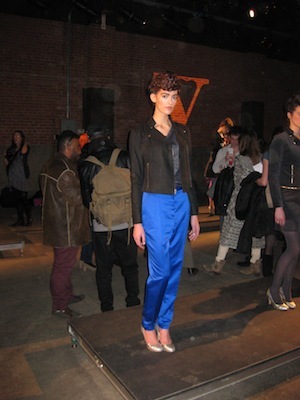 Vaute's fashion show was held in a Meatpacking district warehouse designed to feel like a club, complete with a DJ, open space and creative lighting. While people waited for the show to begin, staff joined in conversations and passed out brownies. The Humane Society, a show's nonprofit co-sponsor, served as an equally integral part of the show. Models carried puppies available for adoption, and afterwards Humane Society volunteers were available to help make those adoptions happen. The result was an event that made people feel that they are more than nameless customers -- they are part of the Vaute Couture family. All in all, Fashion Week's embrace of environmental awareness illustrates how green fashion and the broader fashion world are starting to converge. While following fashion can never be truly thrifty -- as Shakespeare noted, fashion does indeed wear out more apparel than the man -- sustainable style is a lifestyle trend that's here to stay. With contributions by Jeff Trexler, attorney and professor of Fashion Ethics, Sustainability, and Development for the nonprofit Fashion Law Institute, located at Fordham Law School.